This tutorial will take you no more than 5 minutes. 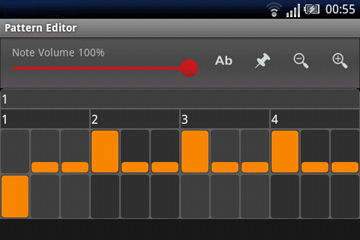 We'll create a simple metronome pattern, in a 4/4 signature, with a triplet feel, and with an accent on the first beat. Open the menu on the main screen a select New. Select OK. The new pattern will be created with a single default track. Open the Mixer and select Add New Track. You should see two tracks. Make sure both tracks have more or less the same volume level. Click the icon to change the sound for the first track, and choose "Clave Low". Change the sound for the second track and choose "Clave High". Use the Back button on your device to return to the main screen. Select Play. You won't hear anything because we haven't written any note, but leave the playback on. Open the Pattern Editor and make sure the Note Volume slider is at100% and that the Freeze Scroll button is pressed. By clicking on the cells of the first track, write a note in the first cell of each one of the four beats. Using the Note Volume slider, select a volume between 25% and 35%. In the first track, write a note on the second and third cells for each beat. Long-press on the first note you wrote (first cell in the first track) and you'll see that the Note Volume slider goes back to 100%, this is because the slider 'copies' the volume from the pressed note. Click again on the first note and it should dissapear. Click on the first cell of the second track. We just created an accent for the first note of each measure using a different sound. The final result must be similar to the image. Use the Back button on your device to return to the main screen and click on the Save button. You can eventually go back to the Mixer to adjust each track's volume. By using these techniques, you can create much more complicated patterns. Try it!